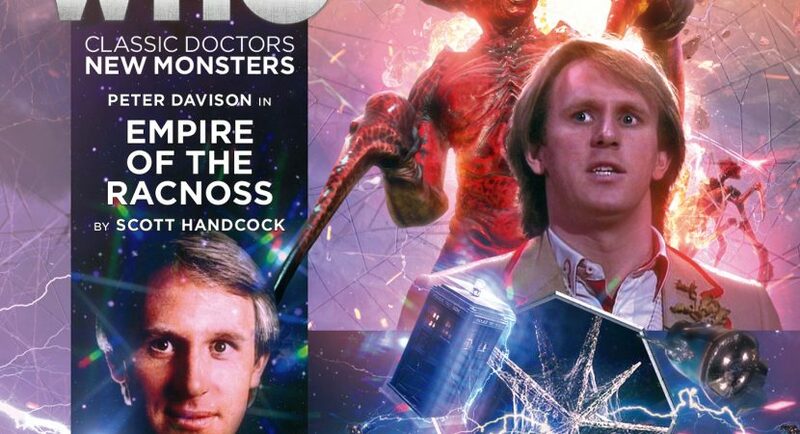 The Fifth Doctor gets sucked into a bloody war between Time Lords and the Empire of the— wait, has he landed in the Time War? Viewers of new Who will appreciate that that this is a prequel to Runaway Bride, exploring the society and politics of the Racnoss, with tantalising glimpses of the web-covered worlds they ruled. Classic Doctors have a poor track record with giant, sentient, angry spider queens, and Five is no exception. If the Empress weren’t enough of a threat, she’s engaged in a life-or-death struggle with a faction of renegade Racnoss and the Time Lords simultaneously. The Doctor has no choice but to get involved. Two fellow prisoners from Gallifrey, not Time Lords but soldiers, wonder just where his loyalties lie. Empress: Your comrades betray you, Time Lord. Doctor: Not at all. There’s no betrayal. I am, as they’ve already said, entirely innocent. One of the Gallifreyans, Alayna, becomes the Doctor’s surrogate companion for this outing, skeptically at first. I was very grateful to hear her northern accent (Gallifrey has a north!) as a brief respite from the Racnoss’ gurgling, hissing, gloating and snarling, which Big Finish does its best to recreate. Fortunately, the characters are interesting enough to carry listeners past campy performances, for the most part: the overbearing but crafty Empress, her beleaguered former Emperor, her new, more sycophantic Consort and the war-hardened Gallifreyans. Plot twists, betrayals upon betrayals and surprise revelations keep the pacing lively, taking advantage of a shorter new Who format. This audio addresses what has been my complaint with many recent Big Finish stories: it’s fine to make the Doctor fallible up to a point, but for goodness’ sake let him do things and succeed part of the time. Five has the Doctor’s usual gift for fast-talking and sarcasm, but he’s also one of the two most athletic classic Doctors, dashing in where angels fear to tread. So let him dash. Let him try to make a difference. Some of the scenes are hampered by clunky relationship squabbles between the Empress and her husbands, which I found grating. On the other hand, I appreciate the way this story forces Five into a sort of practice run for the ethical predicaments the Eighth Doctor will face in the early stages of the Time War. As a bonus, the new Who style orchestral music adds a rich texture to key moments of drama. It’s a good story, and some of Five’s words during the coda are memorable. However, I had some trouble with the melodrama and the exaggerated spider voices that dominated most of the story (not Big Finish’s fault; they used the TV voice as a starting point). No, Big Finish did not screw up continuity by dropping the Fifth Doctor in the Time War, as eventually becomes clear. This is set back in the Dark Times before Gallifrey settled on a (supposedly) non-intervention policy. When exactly is this in the Doctor’s timeline? He alludes to Tegan, but it’s not clear whether she’s still with him. I’m guessing this story is one of the adventures Big Finish has pasted onto the end of Arc of Infinity, when the Doctor either leaves Nyssa and Tegan to explore Amsterdam and catch up while he goes off to troubleshoot a few problems solo (according to The Elite), or when he nips into the TARDIS ahead of them, disappears for an adventure or three and rematerialises almost instantly (according to Waters of Amsterdam, an unnecessary bit of faffing about in my opinion). To be even more confusing, Big Finish’s And You Will Obey Me had Five answer a distress signal and leave while Tegan and Turlough are visiting Tegan’s grandfather following The Awakening. It’s not clear which of these gaps Empire of the Racnoss is set in, but at any rate, there’s enough fiddly bits in the Fifth Doctor’s EU timeline to justify his showing up sans companions. Speaking of companions, Alayna’s final conversation with the Doctor was a little confusing. It sounded like she was asking to travel with him, and as if he had accepted. But she didn’t really make a strong enough splash to be a companion. Nor do I think it likely that BF would tack a new companion onto Peter when there’s so many well-loved, established ones clamouring for a slot in his schedule. Alayna: Is that how you feel, Doctor? Terrified but alive? Doctor: Always. On a good day. Doctor: Today was far from good. Alayna: But you won! You defeated the Empress! Doctor: I didn’t win, Alayna. Nobody did. I just lost a little less than everyone else.